Another Callisto spectrometer (NA014) has been set into operation in Roswell New Mexico, connected to a log-per antenna CLP-5130. 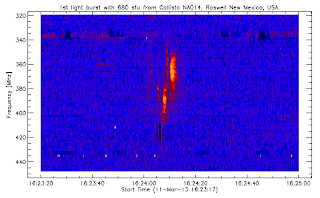 1st ligth burst was observed on March 11th 2013. Thanks and congratulations to Stan Nelson. Welcome on board of the e-Callisto network! This observatory very much increases the American/Pacific coverage. Now we are very close to 24h/365d observation scheme. With this new node we have full coverage 24h/365d. This after 11 years of activity in connection with IHY2007 and ISWI.